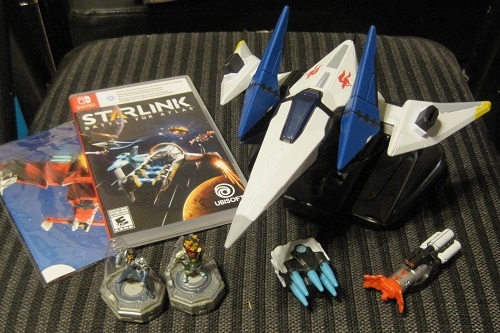 Skylanders, amiibo, and LEGO Dimensions pioneered the whole ‘toys to life’ game genre, but Ubisoft is taking it out of this world with Starlink: Battle for Atlas. Customize different spaceships with pilots, wings, and weapons, and then play as them in this sci-fi space battle action adventure game. It’s available for Switch, PS4, and Xbox One, but reviewed on Switch here. And I think the game is best optimized on the Switch, as you’ll see why if you keep reading! In the game, a group of space explorers discovers a new galaxy, but their captain gets captured by aliens so the crew must work together to save him and stop the evil aliens’ plans. On the Switch version, while this is going on, Fox McCloud and the rest of the Star Fox crew are chasing down the nefarious Star Wolf. They run into the other heroes and decide to help each other out. Yes, that’s right, in the Switch version you can play as Fox McCloud from the Star Fox series and pilot the Arwing as well. You can’t do that in the other versions, but the addition of Fox doesn’t feel shoehorned in. He actually fits with the rest of the story in both the main campaign and side Star Fox missions. Here’s a bigger picture of the front of the Switch version’s box. The game is optimized for the Switch in other ways, too. The game comes with a mount for you to put the controllers into, kind of like the plastic holder for your controllers when you have the Switch in TV mode. Then you can put the pilot on the mount as well, and then put a spaceship over it and weapons on it if you so desire. You can switch out pilots, ships, and weapons at any time. It’s just kind of cool to hold the controller and the spaceship at the same time. Here’s a picture of everything you get in the box. There’s the game, a poster, two pilots, the Arwing, and two weapons (flamethrower and ice missiles). I do wish the pilot figures were a bit bigger, but for Nintendo fans, having a model of the Arwing is almost worth the price of the game alone. Gameplay is like an open world space adventure. There are two types of gameplay modes. While in space, you can fly in any direction and explore wreckages and defend yourselves from outlaws in flight combat battles. Controls are a little different and take a bit of getting used to, but they work. You’ll steer and go forward with the L stick and change direction with the R stick. Use the trigger buttons to fire your lasers, boost, and other abilities. You’ll discover the second type of gameplay mode when you land on a planet. While exploring a planet, you can cut your engines and just hover above the ground, still in your spaceship. You can even press a button to jump. Otherwise the controls are similar to when you’re in space. While there are missions for you to complete to progress the story, since this is an open world game, you can also go off the beaten path to find goodies and do favors for the locals to earn money and parts to modify your spaceships with. I only really had a few problems with this game. You can select your difficulty, but it can still get pretty hard sometimes if you’re not accustomed to flight combat games. Managing your spaceship modifications in the menus can be a bit fiddly, and the game doesn’t really give you good instructions on how to do certain things. Goals are usually pretty clear but sometimes it takes a while for them to give you your next objective. But other than that, this is still a pretty good little game. And for Star Fox fans, while this isn’t really a TRUE Star Fox game, it’s a heck of a lot better than Star Fox Zero, one of Nintendo’s worst games in my personal opinion. 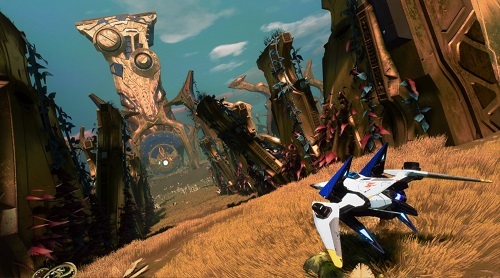 Starlink: Battle for Atlas is rated E-10 with an ESRB descriptor of Fantasy Violence. You mostly just shoot spaceships that blow up, and that’s about as violent as it gets. If you’re OK with your kids watching stuff like Star Wars, they’ll be OK with this game. But because of the reading skill required and more complicated controls and higher difficulty, this is one ‘toys to life’ game that’s best for older players. Not only that, but kids who play this need to make sure they are responsible enough to keep up with and take care of these toys, as the game is useless without them. Although I heard that if you download the game digitally, you can download the toy information, too. Those starship models are pretty substantive. I’d love to collect them when I have some cash.